In December 1956, paroled rebel Fidel Castro returned to Cuba to launch his revolution with a tiny force which was quickly attacked and fled into the mountains. Two years later, through masterful propaganda and factional manoeuvre, Castro, his brother Raul, and iconic revoluntionary Che Guevara had united disparate guerrillas and exploited Cubans' deep opposition to their dictator Fulgencio Batista. Castro's takeover of the cointry became a model for Leftist insurgency. 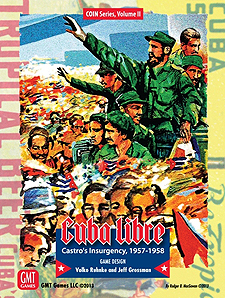 Cuba Libre takes 1-4 players into the Cuban Revolution. Castro's 26 July Movement must expand from its camps in the Sirrra Maestra mountains to fight its way to Havana. Meanwhile, anti-communist student groups, urban guerrillas, and expatriates try to de-stabilize the Batista regime and stave off a new dictatorship under Castro. Batista's Government must maintain steam to counter the twin insurgency, while managing two benefactors: an eroding US Alliance and a corrupting crime Syndicate. In the turmoil, Meyer Lansky and his Syndicate bosses will jockey to keep their Cuban gangster paradise alive.